Here’s a brilliant piece from the eminent Yale Professor Timothy Snyder summarising the argument of his new book, Black Earth: The Holocaust as History and Warning. The Holocaust, and other mass killings, occured – and continue to occur – in conditions of destroyed states. That, Snyder argues, underlies the connection between the Nazi Holocaust and such contemporary meltdowns as the US invasion of Iraq, with its devastating (and continuing) consequences; and most recently, the bloody Russian annexation of Crimea and invasion of Eastern Ukraine. I don’t doubt for a moment that Snyder’s basic thesis will be challenged from all sides. But it’s thoughtful, provocative and required reading nonetheless. How our misunderstanding of the Holocaust offers moral cover for the geopolitical disasters of our time. 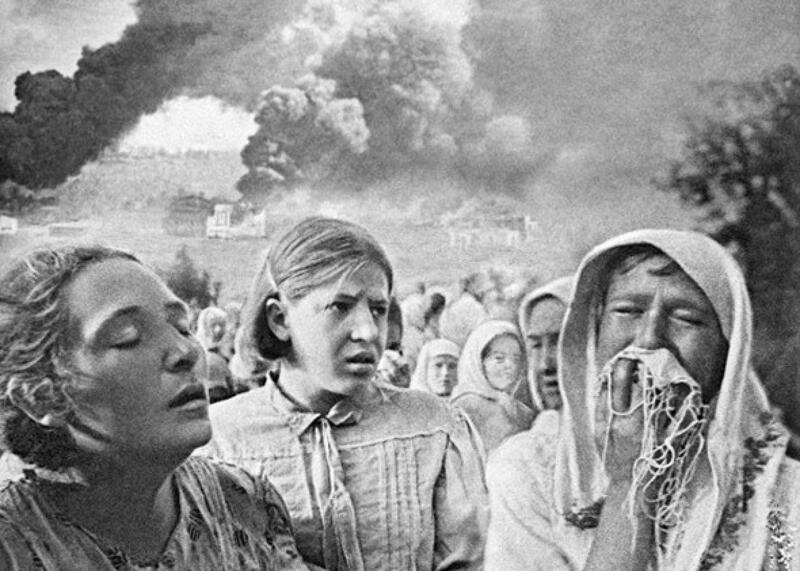 Kiev, June 23, 1941. Grushki district. Kiev, Ukraine. The cantor is a vivid presence in any Jewish congregation, responsible for song, often a man with an outgoing personality and a sense of social engagement. Such a cantor was Eleazar Bernstein, who lived with his wife Martha and their three children in the southwestern German city of Zweibrücken in the 1930s. Among other good deeds, Bernstein would visit Jews in the local prison to lift their spirits. There he befriended a guard, a police captain named Kurt Trimborn, with whom he would play chess. On the night of Nov. 9, 1938, Germans destroyed hundreds of synagogues, including Bernstein’s. On the day after this national pogrom, the infamous Kristallnacht, Bernstein was arrested, along with thousands of other Jewish men throughout Germany, all bound for concentration camps. His neighbors looted his apartment, broke his windows, and stole his furniture. Bernstein’s two sons were too small to understand. Coming home to find a wreck, they amused themselves by throwing things through the gaping window frames. Martha made her way across the rioting city to find her husband’s police captain friend and ask for help. Trimborn told Martha to pack, released Eleazar, and escorted the family across the French border. The car was so full of suitcases that the children had to lie flat on top of them in the back seat. Four decades later, from America, Bernstein sent Trimborn a letter. The two little boys had grown up to become engineers. His daughter was a teacher. There were grandchildren. All of this thanks to Trimborn. The letter was written after Trimborn’s conviction for mass murder. Since destroying states was one cause of the Holocaust, the Holocaust should not be used as a reason to destroy states. Not long after helping the Bernstein family, Trimborn joined the German security police. He was trained for a special task force, an Einsatzgruppe, which was sent behind the invading German army to the Soviet Union. When Trimborn joined his Einsatzgruppe in occupied Soviet Ukraine in October 1941, its men were already murdering entire communities of Jews. That December, as the Red Army halted the German advance and the Americans joined the war after Pearl Harbor, Hitler proclaimed that the Jews were responsible for Germany’s predicament. In 1942, Trimborn personally ordered that hundreds of Jews be murdered, and carried out neck shots himself. One day he herded 214 children from an orphanage into a gas van—a truck refitted so that its exhaust fumes were pumped into the hold rather than into the atmosphere. The children screamed and pounded the walls as they were asphyxiated. One lesson we have learned from the Holocaust is to emulate the rescuers. It is right and good to work against the current, as did Trimborn in 1938, to resist the oppression of groups by helping individuals. But this was not enough to stop a Holocaust in 1941; it was not even enough to stop Trimborn from participating in that Holocaust. We have further lessons to learn. We know that we should resist anti-Semitism. But we overlook that the program of eradicating Jews required sending men such as Trimborn to destroy neighboring states. The SS was not a special state institution but a racial one, grounded in a biological understanding of the world. Its task was to destroy states so that a racial struggle could unfold. When Trimborn saved the Bernstein family, Germany was just beginning to undo European states. When Germany absorbed Austria in 1938, Jews were humiliated. When Germany dismantled Czechoslovakia in 1938 and 1939, Jews were depatriated. After Germany allied with the Soviet Union in 1939, each power invaded Poland with the aim of annihilating the Polish political nation; the Soviet Union also destroyed the three Baltic States of Lithuania, Latvia, and Estonia, separating Jews from their property and traditional legal protections. Already in 1939, during the invasion of Poland, Germany sent Einsatzgruppen behind its army, to kill Polish political elites. In June 1941, when Germany invaded the Soviet Union, Nazis identified the Soviet political class (quite falsely) as the Jews. Einsatzgruppen commanders blamed Jews for the evils of Soviet rule, inviting local people to clear themselves of their own past collaboration with the Soviets by turning on their Jewish neighbors. Germans and locals joined together in the anti-Semitic lie that Jews were responsible for communism. In a war with no rules, German troops blamed Jews for the partisan response they feared and killed them. In a land without laws, German policemen were willing to shoot Jews, thousands at a time, people who were accused of no crime. When Trimborn arrived in Ukraine, just three years after he had saved the Bernstein family, German leaders had learned how statelessness enabled the dark politics of mass murder. Far from Zweibrücken and quiet nights of playing chess, Trimborn would kill, again and again. And so the Holocaust began. Jews who lived before the war in places that became stateless had about a 1-in-20 chance of surviving. Elsewhere in places under German control, even in Germany itself, the probability was more like 1-in-2. The entirety of the killing would take place in a zone of Eastern Europe where the Germans brought anarchy. A man walks past an unexploded rocket in in the eastern Ukrainian city of Kramatorsk, in the Donetsk region, on Feb. 11, 2015. Seeing the Holocaust as an encounter of general anti-Semitism and local statelessness helps us to make sense of the two great geopolitical disasters of our century: the American invasion of Iraq in 2003 and the Russian invasion of Ukraine in 2014. In part because Americans misunderstood the Holocaust as the oppression of a minority by an authoritarian state within its own boundaries, they could believe in 2003 that regime change by force of arms in Iraq would automatically bring positive consequences. By the early 21st century, we had convinced ourselves that the Holocaust was caused by an authoritarian regime acting against a minority within its own borders, which in the main it wasn’t, and that we acted to stop it, which with a few minor exceptions we didn’t. The Holocaust was the mass murder of Jews beyond the borders of prewar Germany, in a zone from which conventional political institutions had been removed, and the Holocaust was largely over by the time Americans soldiers landed on Normandy. American troops liberated none of the major killing sites of the Holocaust, and saw none of the thousands of death pits in the East. The American trials at concentration camps reattributed prewar citizenship to the Jewish victims, helping us overlook that the eliminations of citizenship—usually by the destruction of states of which Jews had been citizens—were what permitted mass murder. A large body of scholarship on ethnic cleansing and genocide concludes that mass killing generally takes place during civil wars or regime changes. Nazi Germany deliberately destroyed states and then steered the consequences toward Jews. Destroying states without such malign intentions creates the space for the kind of disaster that continues to unfold in the Middle East: in its civil wars, religious totalitarianism, and refugee crisis. There are many differences between the American invasion of Iraq and the Russian invasion of Ukraine, but also one clear similarity: In both cases, the Holocaust was used as moral cover. Russians quite rightly remember that the Red Army bore the brunt of the German attack in 1941 and did liberate the Nazi killing zones. But they prefer not to recall that the Soviet Union helped Nazi Germany begin the war in 1939, jointly destroying four East European states and bringing the European order to an end. When Germany betrayed its Soviet ally and attacked the USSR in 1941, spreading anarchy, Soviet citizens joined the Germans as collaborators, tens of thousands of them taking direct part in the shooting. Unnervingly, Russia justified its March 2014 attack on Ukraine by claiming that its neighbor wasn’t a real state, its president invoking the Molotov–Ribbentrop pact of 1939 as normal diplomacy. Since Russia chose to send its troops to Ukraine, claiming absurdly that it meant to combat fascists and save Jews, its war has killed at least 8,000 people and almost certainly far more, driven 2 million people from their homes, and called into question the European legal order. The deliberate creation of a lawless zone in the Donbas has predictably led to kidnappings, executions of prisoners, and other abuses of human rights. The last time a European country invaded another and annexed its territory was the Second World War. European integration was meant to strengthen European states, and thus prevent the political collapse of the 1930s from happening again. The collapse of the European project could mean a return to the bad old days of old-fashioned power politics. We cannot know the exact scenario that might follow if the trend of state destruction proceeds. What we can say is this: Since destroying states was one cause of the Holocaust, the Holocaust should not be used as a reason to destroy states. When institutions are broken, few of us would behave better than the Europeans of Hitler’s era. Hitler seduced Germans by the vision of a world with no rules, where states would crumble and all was permitted. In 1938, while playing chess, Trimborn was a friend. In 1942, in a zone of anarchy, he was a murderer. One of Bernstein’s children lives today in California in a house full of chess sets. Trimborn’s children, until they met Bernstein’s children, were unaware that their father had once known the rules. Timothy Snyder is the Housum Professor of History at Yale University. His most recent book is Black Earth: The Holocaust as History and Warning.